The Marple Leaf: The law won! 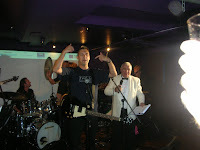 What an amazing experience last night at the Y Factor fundraiser for MENCAP. Eight vocal acts performed with a live backing band, which is much harder than karaoke. We were picked apart by a panel of judges, which included Terry Christian, Angie Robinson and Jo Price from the vocal academy. I performed I Fought The Law by The Clash. I chose this because I can't really sing - but I can shout - and there was plenty of opportunity to ham it up with an electric guitar (unplugged). The winner was Sean Fitzgerald from Cobbetts solicitors who did a belting version of Delilah, causing knicker throwing and mass audience participation. So, yes, I fought the law, and the law won. Everyone did really really well. It was a great night. Mike Reeves and Jeremy Smith put the band together and they were amazing. Real quality. The target for all our efforts was to raise £20,000 for MENCAP. I think we're well on our way. Thanks too to everyone who has sponsored me. The pledges on my justgiving page, here, are up to £695, and I've had cheques, cash and promises up to £1400. If you haven't done so already, please donate to support the great work that MENCAP do in the Manchester area.